The new BAScontrol22C, which supports BACnet client capability in addition to the existing server functionality, is now available. Most BACnet devices are servers, which do not initiate requests to other BACnet devices other than an initial "I-Am" broadcast when first joining the network. 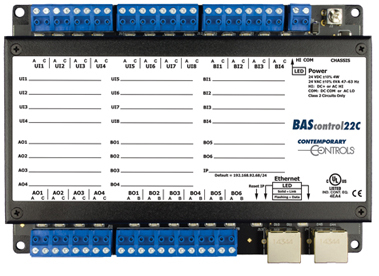 The BAScontrol22C is a BACnet client, which means it can initiate requests and expect BACnet servers to respond to requests as data is exchanged. "The BAScontrol22C gives users the ability to access point values and/or control other BACnet devices in the network," said said Zach Nestov, Product Specialist. "The points obtained over the BACnet network can be used in the BAScontrol22C's Sedona wire sheet application logic, become scaled, calculated, and/or converted to different data types, written to other BACnet devices, served up to BACnet supervisory controllers and operator workstations by using Virtual Components, as well as be monitored, displayed, or exposed for configuration on BAScontrol22C's web page by the use of Web Components." Reading points over BACnet networks can be very useful in several applications such as reading an outside air temperature from a BACnet networked sensor device, reading zone temperature, humidity, CO2 PPM, and other comfort parameters from a BACnet networked wall setter/thermostat device, or exchanging control values/points with another BACnet controller or supervisory controller/ workstation. In remote access applications, by employing Remote Access VPN IP routers (such as EIPR-V, EIGR-V), the BAScontrol22C can obtain BACnet points from devices on a remote BACnet network. The BAScontrol22C supports BACnet/IP Client and Server functionality using a 2-port Ethernet switch connection. The controller complies with the B-ASC device profile having a convenient mix of 8 universal inputs, 4 binary inputs, 4 analog outputs, and 6 relay outputs. In addition to 22 physical points, the BAScontrol22 has 24 Virtual Points for use in wire sheet and data exchange with BACnet supervisors. The BAScontrol22C uses its direct Ethernet ports to communicate to BACnet/IP devices on the network. With the help of a BASrouter – BACnet/IP to BACnet MS/TP router – the BAScontrol22C can communicate and interface with BACnet MS/TP devices as well. Learn more on the BAScontrol22C product page.